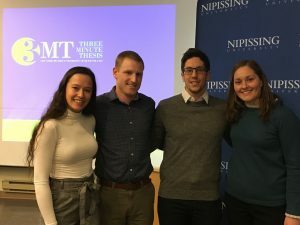 On Tuesday March 19th, 2019, PPAHP students Jordan Sutcliffe, Alanna Shwed, and Quintin McCluskie participated in Nipissing University’s 3 Minute Thesis (3MT) competition. 3MT is a university wide competition for masters and doctoral students to present their research and its wider impact to non-specialist judges in less than 3 minutes. The challenge is to present complex research in a compelling, engaging way using only one slide. Placing first in the competition was Jordan Sutcliffe, with his presentation titled Rink Rage. 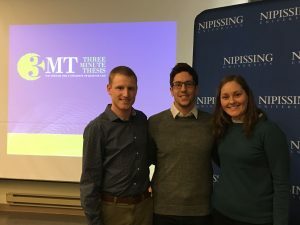 Jordan will move on to the provincial 3MT competition at McMaster University on April 17th, 2019. Alanna Shwed won the people’s choice award with her presentation titled The Timbits Effect, and Quintin McCluskie had a stellar presentation with his project titled Food Skills. Daryl Tjin, also of the MSc Kinesiology program, placed second with her presentation Can You Keep a Secret. The PPAHP lab would like to congratulate all participants for their engaging presentations. 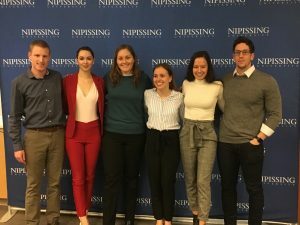 For more information on Nipissing’s 3MT competition, click here.